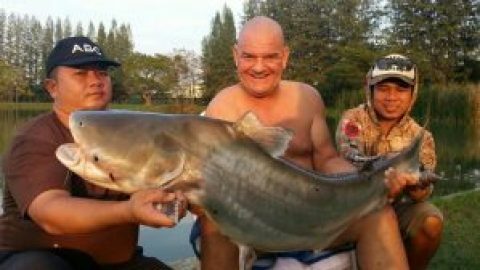 Russian anglers Stingray fishing Mae Klong River. 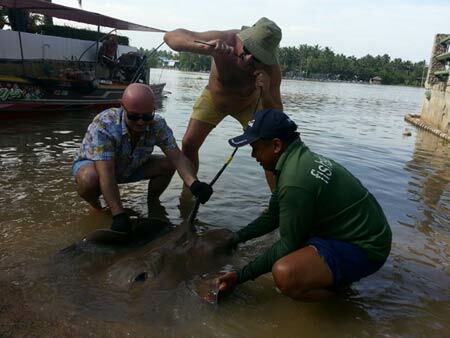 Angler Piotr and his group of anglers from Russia started their Thailand fishing holiday with a trip to the Mae Klong River fishing for Giant freshwater stingrays. On arrival the anglers were soon positioned on a wide section of the river with baits positioned along the main channel. The first few hours passed without event before a slow but determined take saw the anglers attached to the first Giant freshwater stingray of the trip. Winding down into the unseen stingray saw the rod take up a healthy bend as battle commenced. After clamping onto the bottom on a few occasions the stingray was slowly brought off the riverbed into open water. The heavy duty big game equipment soon had the stingray under control and the stingray was brought over the waiting net several minutes later. After bringing the fish to the riverside it was observed to be a small male of an estimated 45kg’s. The anglers continued fishing into the afternoon, but despite receiving several aborted takes no further fish were landed. H2: Day 2 stingray fishing Mae Klong River The second day of Piotr’s trip saw the anglers once again fishing at the Mae Klong River in Thailand. After a quiet start and with the river level rapidly rising, one of the baits was picked up by an unseen freshwater stingray. On this occasion the Giant freshwater stingray was brought off the bottom quickly and slowly brought up to the waiting net. On inspection the stingray was identified as being another small male and was estimated to weigh 30-35kg. Several aborted takes followed before another Giant freshwater stingray was hooked. Once again the stingray was beaten after a short ten minute battle and brought to the riverside. The Giant freshwater stingray was identified as being a small female of an estimated 40 kg’s and was released after a few trophy shots.